Mont Saint-Michel is on the bucket list of many expats in Brussels. But since it is far away and without good public transportation connections, basically the only way to get there is by car. Therefore Expat Club is organising a convenient Easter weekend trip with a luxury coach from Brussels and with many really nice fellow expats. This allows you to relax, meet new friends and enjoy a fantastic program with special guided tours that you would not be able to arrange on your own. This trip will be mega special, because when we are there the high tide is “super high” with 13.75 meters and will make the island an actual island again, which happens only a few times per year (out of 2 x 365 high tides per year!). 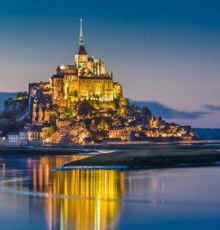 Also, since it is full moon we will be at Mont Saint-Michel at one of the most magical moments.